Why People Love or Hate Weimaraner Dogs! Weimaraner temperament is the reason people love Weimaraner dogs and also the reason that people get rid of Weimaraner puppies. If you are considering getting a Weimaraner, it is crucial that you understand how your dog will behave and react to various circumstances. Dogs of this breed have a distinctive personality and disposition. Just like people, they each have their own individual characteristics. But, in general, the breed of Weimaraner dogs and puppies all have a few things in common. 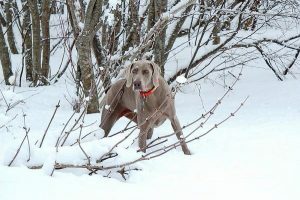 Weimaraners are fun loving and enjoy the outdoors. Understanding the Weimaraner temperament is crucial for anyone interested in this breed. Weimaraner dogs are bold, yet friendly. And they are sometimes challenging to raise. Because Weimaraners are a hunting dog, they are full of energy and are better suited for a person or family that can exercise them frequently and regularly. 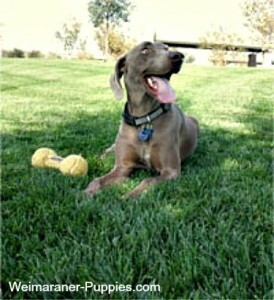 This Weimaraner temperament is perfect for people who are highly active, such as joggers or hunters. Weimaraners are strong and athletic and they naturally love hunting and being outdoors with you. If you live in an apartment, and you decide to buy or adopt a Weimaraner, you will need to make a special effort to give your dog enough exercise, each and every day! But, because this breed requires so much exercise, it is best to have a big place with a big yard for him to run and stretch his legs in. The Weimaraner’s temperament can be quite stubborn and independent. Sometimes people mistake that for stupidity. But, in fact, Weimaraner dogs are highly intelligent. Proper training is a must with this breed. Quite often your Weimaraner will yawn while you’re giving him a command. And because these dogs are easily distracted, you should keep training sessions short. With the right approach, Weimaraner dogs will learn very quickly. It is important to socialize puppies early on–to avoid aggression. Weimaraners are very protective of their families and can be territorial. They also tend to be cautious of strangers, and that can make them great watch dogs. They love human companionship and require a lot of attention. Do not leave a Weimaraner unattended for too long. They can get very bored and depressed if neglected. And they often suffer from separation anxiety when left alone. An untrained and unconfined Weimaraner will be destructive. Even though they don’t like to be confined, crate training your Weimaraner is highly recommended (at least until she is housetrained). How do Weimaraners Get Along With Cats and Kids? With lots of love and attention, the Weimaraner makes a great family pet. Weimaraners love their family, including children. Be careful though, with small children, as your Weimaraner might knock them down. You’ll need to train your Weimaraner not to jump. Also, be careful with cats or other small pets. Many Weims get along well with cats. However, because they are hunting dogs, natural instincts can take over. Cats and other small animals can be mistaken for prey! Fortunately the Weimaraner temperament makes him an exceptional companion with a unique blend of friendliness and toughness. Give your Weim lots of loving attention, consistent and patient training, exercise and room to run—and you’ll end up with a wonderful, affectionate house pet.